Now, I know that overall the makeup looks pretty good, but I’ve realized that makeup is a very subjective, personal thing, and I now realize that I didn’t love it. I think I got caught up in the hype of Shirley Wu and just booked her because she was so coveted. I know some girls may be saying well you could just tell her to tweak the things you don’t like…which brings me to my second point. 2. I feel like its impossible to get a hold of her. Don’t get me wrong when I went for my trial with Shirley, I loved her personality!!! She’s SO instantly warm, so comforting she’s a professional and makes you feel taken care of. But her front desk doesn’t exactly make you feel that way. I’ve called a few times and left a few messages as I just want to be able to talk to Shirley – myself – but because she is so big, and there is a machine around her, you’re never let through. I didn’t want to tell her my desired tweaks on the day of my wedding, I wanted to be able to talk about them now. What really made me realize this was the other day when I was in MAC looking for fake eyelashes for the wedding and the MUA there was like: “can I ask you something though? Why are YOU the one looking for eyelashes? Your MUA should be doing that for you.” Which made me think yes you’re so right…but it’s seemingly impossible to even talk to mine! 3. She won’t travel. (At least she won’t on the long weekend because she has back-to-back brides booked). Originally I thought I was fine with this. Now that its closer to the date I realize that getting ready from 3:30 – 5:30 pm in Mississauga on the Friday of a long weekend and then having to travel to Vaughn which would be a guaranteed two hours stuck in traffic on my wedding day was never a good idea. Why I thought this was reasonable when I booked Shirley? I don’t know; again probably the hype. But now, I’ve booked a hotel suite 2 min away from the banquet hall where my bridal party can come get ready, we can all be ready by 4, take pictures outside on the cute grounds at Paradise and then wait for the baraat (Groom’s party to arrive) without the stress of travel in the heat of August. I’m feeling really good about my decision, but now fingers crossed that I actually find a makeup artist’s whose work I fall in love with – on my face. Anyone else have stories, tips, opinions, advice about wedding day makeup?! Hi Layla! Cool! I will definitely check her out:) Thanks! Don’t blame you at all. I ended up cancelling her as well. I booked her for the wedding and reception make up, and was initially told that Shirley Wu would be doing the make up…but as the date approached I was informed that Shirley could not do it because she was booked, but instead her assistant would be the one doing my make up. Not a good experience and hassle to go through! Hi Nisa, Aw sorry to hear! I’m glad that there is more and more emerging talent in this market now! Hey Amrita! I ended up going with Summera from Summera Studios for my hair, makeup and dupatta setting – I loved her, and liked her makeup WAY more than Shirleys (check out Day 2 Shaadi vs. Day 3 valima and see for yourself). The link to her page is there as well! Good luck!! Hi there – did you use summera for both hair, makeup and photography? were her prices reasonable? Hey! Just hair and makeup on my wedding – and yes her prices were significantly cheaper than Shirley, including travel! Thank you – I love your blog btw, just found it. So helpful. Also, I really like the gold vases you got for your centrepeices — where did you get them and how much if you dont mind me asking? Thank you Saf. Does she only use Mac products? I have a hard foundation colour, so I want to make sure the colour matches! Also, how are her fake eyelashes? I find the other MUA, even Shirley’s use very fake (not natural) lashes. I sent her a note, have not heard back yet. Hey, she used a combo of professional makeup products and I hate fake looking eyelashes so we picked ones together that suited me. I would recommend doing a trial with her so that you can see for yourself! Im a bride to be-its been quite a while I’ve been trying to get the hold of Shirley Woo through her secretary Richard. I now gave up on Shirley. I have left a message to Summera. I’ll definitely try her out. Hi Shahida, Congrats on your upcoming shaadi. Beyond the vendors that I used, I don’t know of any of the top of my head, but I’ll think about this for a future post! Did you love her hair as well compared to Shirley? I am still debating between the both. I just want to make sure they can do awesome hair and makeup! Thank you! Haha so to be clear I don’t Shirley sets the bar at all! I just think she has a lot of hype around her. Her hair was fine, I didnt like her makeup, my opinion is that summera is way better on both fronts! Don’t forget the makeup artists who aren’t Indian but exceptionally trained for all cultures! You are not limited. I’m not Indian but Bollywood Actress Mallika Sherawat relies on me when she comes to Toronto for events; even when I’m already booked she manages to charm me into fitting her into my schedule. You brides deserve choice and celebrity treatment! Do you have a website? I have been looking for “non-indian” make up artists as I feel they understand my needs much better. Hi, thanks so much for your blog, it was so helpful! I’m having a hard time finding a makeup artist who doesn’t “cake it on”. I was so set on Shirley Wu and still sort of am, however, I will definitely shop around. Hi Nishi, ya its definitely tough to find the right makeup artist! 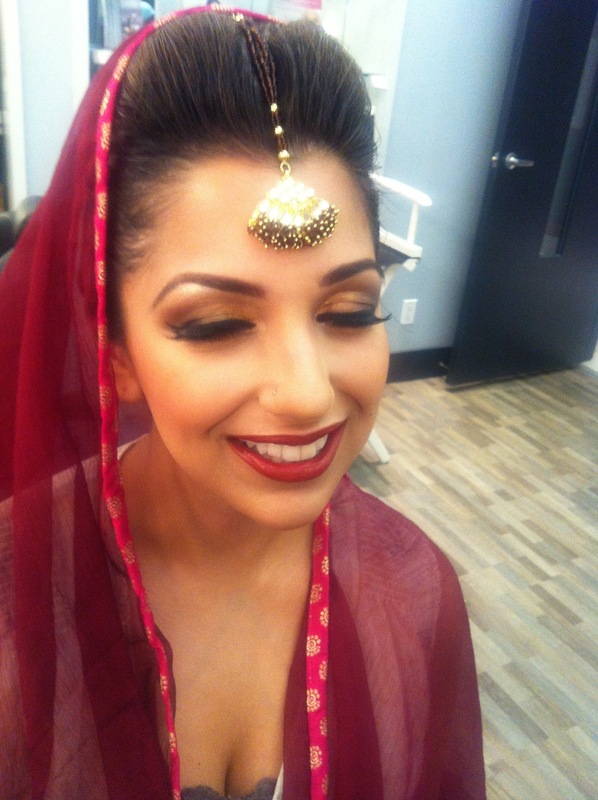 If youve read my blog you know I loved my shaadi MUA, Summera! Good luck with all the trials! Ladies, check out Beauty Box by K&B.. their work looks amazing. They are the one to watch I think. I totally was not happy with her work. She double booked me and she rushed my makeup. I actually had to remove it and get a friend to basically Re do most of it. Not happy with her at all. I think she is just the famous shirley wu and known to do indo pak bridal makeup. I would highly recommend xpressions. My sis inlaw got her makeup done by them and I can say it was a million times better than shirley wu. I got married 8 years ago but I’m still bothered by it till today. Hi Safa! I just want to thank you sooo soo much for doing sucha a detailed blog for your wedding. I am getting married this year and let me tell you that your blog is a great helpt o decide my MUA. I am considering Honey beauty lounge for my reception. any views on her? Someone told me to try Noreens as well… I have looked into booking Shirley but I feel like now looking at her work, all of her looks are becoming very signature Shirley look. I am so glad to find out your blog which made my search a lot easier.